Explore the Unique Beauty of God's Own Place adding spices to your life. Make your journey a dream come true experience. Present your loved ones with the clear splendor of what you have. Rover Holidays Kerala trip is a specially crafted 18 nights’ and 19 days’ Kerala tour package for the explorers, packed with fun expeditions, scenic locales and heavenly view of Munnar. This exclusive trip includes Coaching sightseeing, Boating in Marine Drive, Kovalam- the internationally renowned beach destination. sightseeing of Trivandrum. The temple of Anantha, the Sri Padmanabhaswamy temple. Munnar the gateway of Hills in South India. On the way you can also watch the lovely waterfalls of Cheeyappara & Valara. Thekkady, it offers diverse attractions wildlife sanctuary, hill station, and spice plantation. Kumarakom, a place best known for the honeymooners. It is a cluster of little islands on the Vembanad Lake and make some beautiful memories. 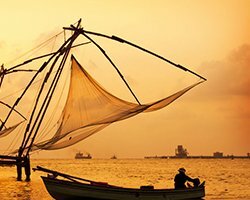 Book this exclusive Kerala tour package Now.